طیبی, مرتضی, شریفی, حسن, غیور, حمید. (1394). مشخصه‌یابی سیکل‌های حرارتی و مطالعه رفتار انبساط حرارتی کامپوزیت‌ آلیاژ Al-4%Cu تقویت شده با ذرات SiC. 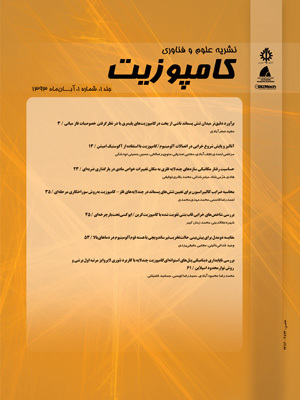 علوم و فناوری کامپوزیت, 2(2), 55-62. مرتضی طیبی; حسن شریفی; حمید غیور. "مشخصه‌یابی سیکل‌های حرارتی و مطالعه رفتار انبساط حرارتی کامپوزیت‌ آلیاژ Al-4%Cu تقویت شده با ذرات SiC". علوم و فناوری کامپوزیت, 2, 2, 1394, 55-62. طیبی, مرتضی, شریفی, حسن, غیور, حمید. (1394). 'مشخصه‌یابی سیکل‌های حرارتی و مطالعه رفتار انبساط حرارتی کامپوزیت‌ آلیاژ Al-4%Cu تقویت شده با ذرات SiC', علوم و فناوری کامپوزیت, 2(2), pp. 55-62. طیبی, مرتضی, شریفی, حسن, غیور, حمید. مشخصه‌یابی سیکل‌های حرارتی و مطالعه رفتار انبساط حرارتی کامپوزیت‌ آلیاژ Al-4%Cu تقویت شده با ذرات SiC. علوم و فناوری کامپوزیت, 1394; 2(2): 55-62. اگرچه در حال حاضر کامپوزیت Al/SiC موضوع تحقیق‌های زیادی است اما توجه کمتری به خواص فیزیکی و به‌ویژه پایداری ابعادی آن شده است. به‌همین دلیل سعی بر آن شده است که در این پژوهش به بررسی خواص حرارتی-فیزیکی این کامپوزیت‌ها و مدل‌های ارائه شده برای این خواص پرداخته شود. به این منظور ابتدا آلیاژ Al/4%Cu به روش آلیاژسازی مکانیکی تولید شد و سپس کامپوزیت آلومینیوم با درصدهای مختلف کاربید سیلیسیم (با اندازه ذرات متفاوت) به روش متالورژی پودر ساخته شد. با انجام آزمون حرارتی بر روی کامپوزیت‌های Al-4%Cu/SiC مشخص شد که با افزایش کسر حجمی ذرات SiC تا 25 درصد، ضریب انبساط حرارتی کامپوزیت به‌صورت خطی کاهش یافته است که این امر حاکی از حضور ذرات سرامیکی با ضریب انبساط حرارتی بسیار کم در کامپوزیت است و همچنین نتایج بیانگر این بوده است که با افزایش دما تا 500 درجه سانتی گراد ضریب انبساط حرارتی تا 6/20 برای کامپوزیت دارای 15 درصد ذرات تقویت کننده افزایش یافته ولی این افزایش خطی نبوده است. آزمون‌های حرارتی به‌منظور بررسی تأثیر اندازه ذرات تقویت کننده بر ضریب انبساط حرارتی کامپوزیت Al-4%Cu/SiC انجام گرفت. با توجه به آزمایش‌ها مشخص شد که اندازه ذرات تقویت کننده تأثیر محسوسی بر ضریب انبساط حرارتی کامپوزیت ندارد ولی به میزان % 8/0 سبب کرنش حرارتی کامپوزیت‌ می‌شود. Although Al/SiC composite has attracted much attention of the researchers, no due attention has been paid so far to its physical properties particularly its dimensional stability. Therefore, the objective of this research is to investigate the thermal-physical properties of these composites and the presented models of these properties. Initially, the Al/4%Cu alloy was prepared by mechanical alloying, and then the aluminum composite was synthesized with different percentages of silicon carbide (with different particle sizes). To characterize the composite hardness and density tests were performed. Thermal test on the Al-4%Cu/SiC composites revealed that with increase of volume fraction of SiC particles up to 25%, thermal expansion coefficient of the composite has decreased linearly, which indicates the presence of ceramic particles with very low thermal expansion coefficient in the composite. Also, these results reveal that with increase of temperature up to 500°C, thermal expansion coefficient has increased up to 20.6 for the composite with 15% of reinforcement particles, although this increase is not linear. In order to investigate the effect of the reinforcement particles size on thermal expansion coefficient of the Al-4%Cu/SiC composite thermal tests were performed which indicated that the reinforcement particles size has no conspicuous effect on thermal expansion coefficient of the composite but causes a thermal strain of 0.8% in the composite to some extent. Yuan, G. M. Li, X. K. Dong, Z. J. Westwood, A. Cui, Z. W. and Cong, Y., "Graphite blocks with preferred orientation and high thermal conductivity," Carbon, Vol. 50, No. 1, pp. 175–82, 2012. Mallik. S, Ekere. N, Best. C, and Bhatti. R., "Investigation of thermal management materials for automotive electronic control units", Appl Therm Eng, Vol. 31, pp. 355–62, 2011. Mizumoto. M, Tajima. Y, and Kagawa, A., "Thermal Expansion Behavior of SiCP/Aluminum Alloy Composites Fabricated by a Low-Pressure Infiltration Process", Materials Transactions, Vol. 45, No. 5, pp. 1769–1773, 2004. Chen, J. K. and Huang, I. S., "Thermal properties of aluminum–graphite composites by powder metallurgy", Composites, Part B, Vol. 44, pp. 698–703, 2013. Zhiwu, X. Jiuchun, Y. Weiwei, Z. Huibin, X. and Shiqin, Y., "Thermal expansion behavior and performance of VLP diffusion-bonded joints of SiCp/A356 composites", Composites Science and Technology, Vol. 65, pp. 1461–1467, 2005. Song, J. L. Guo, Q. G. Gao, X. Q. Shi, J. L. and Liu, L., "Microstructer and thermophysical properties of graphite foam/glass composites", Carbon, Vol. 49, No. 4, pp. 1479–83, 2010. Zweben, C., "Advanced thermal management materials for electronics and photonics", Adv Microelectron, Vol. 37, No. 4, pp. 14–9, 2010. Ellsworth, M. J., "Chip power density and module cooling technology projections for the current decade", In: 9th Inter soc conf on thermal and thermomech phenom in electron syst (I-THERM), Las Vegas, Nevada, USA, pp. 707–8, 2004. Tan, Z. Q. Li, Z. Q. Fan, G. L. Kai, X. Z. Ji, G. Zhang, and L. T., "Enhanced thermal conductivity in diamond/aluminum composites with a tungsten interface nanolayer", Mater Design, Vol. 47, 160–6, 2013. Wu, J. H. Zhang, H. L. Zhang, Y. Li, J. W. and Wang, X. T., "Effect of copper content on the thermal conductivity and thermal expansion of Al–Cu/diamond composites", Mater Des, Vol. 39, pp. 87–92, 2012. Chu, K. Jia, C. C. Liang, X. B. Chen, H. Gao, W. J. and Guo, H., "Modeling the thermal conductivity of diamond reinforced aluminium matrix composites with inhomogeneous interfacial conductance", Mater Des, Vol. 30, pp. 4311–6, 2009. Schubert, T. Ciupinski, L. Zielinski, W. Michalski, A. Weibgarber, T. and Kieback, B., "Content on the thermal conductivity and thermal expansion of Al–Cu/diamond composites", Materials and Design, Vol. 39, pp. 87-92, 2012. Khorunzhii, I. Gabor, H. Job, R. Fahrner, W. R. Denisenko, A. and Brunner, D., "Steady-state thermal conductivity measurements of super-hard materials", Measurement, Vol. 32, pp. 163–72, 2002. Chen, N. Zhang, H. Gu, M. and Jin, Y., "Effect of thermal cycling on the expansion behavior of Al/SiCp composite", Journal of materials processing technology, Vol. 209, pp. 1471–1476, 2009. Wu, J. Zhang, H. Zhang, Y. Li, J. and Wang, X., "Effect of copper content on the thermal conductivity and thermal expansion of Al–Cu/diamond composites", Materials and Design, Vol. 39, pp. 87–92, 2012. Wei, Z. Ma, P. Wang, H. Zou, C. Scudino, S. Song, K. Prashanth, K. G. Jiang, W. and Eckert, J., "The thermal expansion behaviour of SiCp/Al–20Si composites solidified under high pressures", Materials and Design, Vol. 65, pp. 387–394, 2015. Arpo´n, R. Molina, J. M. Saravanan, R. A. Garcı´a-Cordovilla, C. Louis, E. and Narciso, J., "Thermal expansion behaviour of aluminium/SiC composites with bimodal particle distributions", Acta Materialia, Vol. 51, pp. 3145–3156, 2003. Upadhyaya, G. S., "Powder Metallurgy Technology", First ed., Cambridge Int Science Publishing, England, 1997. Ruiz-Navas, E. M. Fogagnolo, J. B. Velasco, F. Velasco, J. M. and Froyen, L., "One Step Production of Aluminium Matrix Composite Powders by Mechanical Alloying", Composites Part A, Vol. 37, pp. 2114-2120, 2006.